The park features a lot of attractions like go-cart racing, an extensive kiddie-land, small water rides/waterpark, miniature golf, pavilion and catering amenities. The park also hosts several annual events throughout the whole year. The “Summer Thunder” fireworks show for the 4th of July is a highlight of the park's season. Other events include the Native American Pow Wow, Italian Festival and Harvestfest which is a fall festival held in September to close out the season. The park also hosts "Spaghetti Wednesday" which features a special Italian dish each Wednesday during the summer. Park Food Perks! - enjoy some of their Park favorites at a discounted price! Bring a Buddy for $10 (2x a week) for just $10 (Mon-Fri only) Not Valid Holidays. 10% Discount on Select Gift Shop Items (+ or - rounded to the nearest $0.25) Free Admission to Harvestfest 2019! 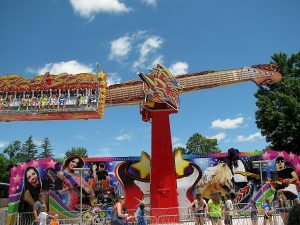 Other Specials & Coupons To view DelGrosso’s Amusement Park Admission Tickets, other Specials and Coupons, go to their special page by clicking here. DelGrosso’s Amusement Park updates this page throughout the year, so check back to see if new specials and coupons have come in. Note to our visitors: DelGrosso’s Amusement Park coupons and specials can change without notice. So please visit their official website to make sure of the latest pricing and coupons.